It's rare that communications work follows a straight line on any given day, and that's been especially true this year. We've all juggled and faced challenges: reduced budgets and revenue, team anxiety about job security, and all the unknowns that come with social media, journalism's paroxysms, and the changing communications landscape. 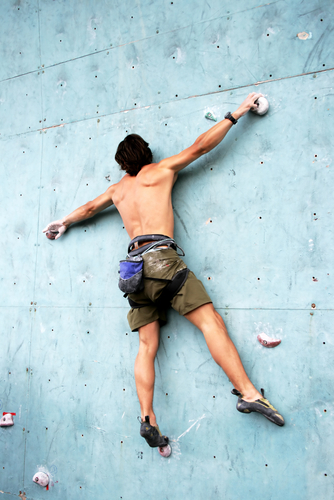 Have you found new footholds and handholds? There are lots of new niches in the wall you're climbing, places where you can grab hold of ideas, connections and audiences in new ways. What's emerged for you and your team this year? How does it affect what you want to do next year? Where will you place your next steps up the side of the mountain? Who are the carabiners on your team--and outside your team? Climbers use carabiners, metal rings with spring-loaded gates, as connectors. Taking retreat time to identify who has that function can help extend your reach on next year's climbs. Figure out whether your carabiners were assigned that role or naturally gravitate toward it; what they're noticing about their connections; and who's serving that role for you outside your team and bringing connections to you. It's from this type of analysis that you can grow more connections and collaborators -- and find new projects and ideas. What technologies could give you an Alpine start? Climbers who get their gear ready the night before and rise early are said to have the Alpine start, which means they can climb further, faster on the big day. Social media tools have made many communications tasks more efficient--or could, if your team uses them. Taking the time to hear each staffer's nominees for tools that will make the team efficient, and a discussion on where to put that new-found time to use, can make you more productive in the year ahead. Who's on your climbing team? Also worth considering: Do the new tools change team roles or workflow in any way? How will you codify that change going forward? This is especially important to reconsider annually, as we continue to adjust to a changing set of tools and options...and as team members are asked to master more technologies and leave other tasks behind. Your team is already thinking about this, so it's an important topic to air and discuss. How's the team mind before the climb? It's always worth letting team members take the time to assess not only the significant milestones (good and bad) from their work life in the past year, but those in their personal lives. I've got a great exercise for letting these themes emerge for discussion. Personal and professional events affect the work, so plan on checking in on what's really on their minds during your retreat. Here are 10 examples of communications retreats my clients have requested--and I'm happy to work with your team to customize a retreat that meets your needs. Email me at info[at]dontgetcaught[dot]biz to get the discussion started. Subscribe to For Communications Directors, my free monthly newsletter, which features content before it appears here on the blog. Then head over to don't get caught on Facebook, where you'll see new social media trends, technology and communications issues as they crop up during the week--and great conversations with our community of communicators.